‘Mechanical analysis of isolated microtubules based on a higher-order shear deformation beam theory’, Composite Structures, Elsevier, ISSN: 0263-8223, Volume 118, 2014, Page No. 9-18. Authors: Akgöz, B. and Civalek, Ö. ‘Vibration analysis of micro-scaled sector shaped graphene surrounded by an elastic matrix’, Computational Materials Science, Elsevier, ISSN: 0927-0256, Volume 77, 2013, Page No. 295-303. Authors: Civalek, Ö. and Akgöz, B. ‘A size-dependent shear deformation beam model based on the strain gradient elasticity theory’, International Journal of Engineering Science, Elsevier, ISSN: 0020-7225, Volume 70, 2013, Page No. 1-14. Authors: Akgöz, B. and Civalek, Ö. ‘Buckling analysis of functionally graded microbeams based on the strain gradient theory’, Acta Mechanica, ISSN: 0001-5970, Volume 224, No. 9, 2013, Page No. 2185-2201. Authors: Akgöz, B. and Civalek, Ö. ‘Modeling and analysis of micro-sized plates resting on elastic medium using the modified couple stress theory’, Meccanica, ISSN: 0025-6455, Volume 48, No. 4, 2013, Page No. 863-873. Authors: Akgöz, B. and Civalek, Ö. ‘Free vibration analysis of axially functionally graded tapered Bernoulli-Euler microbeams based on the modified couple stress theory’, Composite Structures, Elsevier, ISSN: 0263-8223, Volume 98, 2013, Page No. 314-322. Authors: Akgöz, B. and Civalek, Ö. ‘Free vibration analysis for single-layered graphene sheets in an elastic matrix via modified couple stress theory’, Materials and Design, Elsevier, ISSN: 0264-1275, Volume 42, 2012 , Page No. 164-171. Authors: Akgöz, B. and Civalek, Ö. ‘Mathematical modeling of vibration problem of nano-sized annular sector plates using the nonlocal continuum theory via eight-node discrete singular convolution transformation’, Applied Mathematics and Computation, Elsevier, ISSN: 0096-3003, Volume 219, No. 6, 2012, Page No. 3226-3240. Authors: Gürses, M., Akgöz, B. and Civalek, Ö. ‘Investigation of size effects on static response of single-walled carbon nanotubes based on strain gradient elasticity’, International Journal of Computational Methods, World Scientific Publishing, ISSN: 0219-8762, Volume 9, No. 2, 2012. Authors: Akgöz, B. and Civalek, Ö. ‘Comment on “Static and dynamic analysis of micro beams based on strain gradient elasticity theory” by S. Kong, S. Zhou, Z. Nie and K. Wang, (International Journal of Engineering Science, 47, 487-498, 2009)’, International Journal of Engineering Science, Elsevier, ISSN: 0020-7225, Volume 50, No. 1, 2012, Page No. 279-281. Authors: Akgöz, B. and Civalek, Ö. ‘Analysis of micro-sized beams for various boundary conditions based on strain gradient elasticity theory’, Archive of Applied Mechanics, Springer, ISSN: 0939-1533, Volume 82, No. 3, 2012, Page No. 423-443. Authors: Akgöz, B. and Civalek, Ö. ‘Analysis of microtubules based on strain gradient elasticity and modified couple stress theories’, Advances in Vibration Engineering, Krishtel eMaging Solutions, ISSN: 0972-5768, Volume 11, No. 4, 2012, Page No. 385-400. Authors: Akgöz, B. and Civalek, Ö. ‘Nonlinear vibration analysis of laminated plates resting on nonlinear two-parameters elastic foundations’, Steel and Composite Structures, Techno Press, ISSN: 1229-9367, Volume 11, No. 5, 2011, Page No. 403-421. Authors: Akgöz, B. and Civalek, Ö. ‘Strain gradient elasticity and modified couple stress models for buckling analysis of axially loaded micro-scaled beams’, International Journal of Engineering Science, Elsevier, ISSN: 0020-7225, Volume 49, No. 11, 2011, Page No. 1268-1280. Authors: Akgöz, B. and Civalek, Ö. ‘Buckling analysis of cantilever carbon nanotubes using the strain gradient elasticity and modified couple stress theories’, Journal of Computational and Theoretical Nanoscience, American Scientific Publishers, ISSN: 1546-1955, Volume 8, No. 9, 2011, Page No. 1821-1827. Authors: Akgöz, B. and Civalek, Ö. ‘Large deflection analysis of laminated composite plates resting on nonlinear elastic foundations by the method of discrete singular convolution’, International Journal of Pressure Vessels and Piping, Elsevier, ISSN: 0308-0161, Volume 88, No. 8-9, 2011, Page No. 290-300. Authors: Baltacıoğlu, A.K., Civalek, Ö., Akgöz, B., Demir, F.
‘Application of strain gradient elasticity theory for buckling analysis of protein microtubules’, Current Applied Physics, Elsevier, ISSN: 1567-1739, Volume 11, No. 5, 2011, Page No. 1133-1138. Authors: Akgöz, B. and Civalek, Ö. ‘Free vibration analysis of microtubules as cytoskeleton components: Nonlocal Euler-Bernoulli beam modeling’, Scientia Iranica, Transaction B- Mechanical Engineering, Sharif University of Technology, ISSN: 1026-3098, Volume 17, No. 5, 2010, Page No. 367-375. Authors: Civalek, Ö. and Akgöz, B. ‘Nonlinear static response of laminated composite plates by discrete singular convolution method’, Composite Structures, Elsevier, ISSN: 0263-8223, Volume 93, No.1, 2010, Page No. 153-161. Authors: Baltacıoğlu, A.K., Akgöz, B., Civalek, Ö. ‘Free Vibration and Bending Analyses of Cantilever Microtubules Based On Nonlocal Continuum Model’, Mathematical and Computational Applications, Association for Scientific Research, ISSN: 1300-686X, Volume 15, No. 2, 2010, Page No. 289-298. Authors: Civalek, Ö., Demir, Ç., and Akgöz, B. ‘Free Vibration Analysis of Carbon Nanotubes Based on Shear Deformable Beam Theory by Discrete Singular Convolution Technique’, Mathematical and Computational Applications, Association for Scientific Research, ISSN: 1300-686X, Volume 15, No. 1, 2010, Page No. 57-65. Authors: Demir, Ç., Civalek, Ö. and Akgöz, B. 'Static analysis of functionally graded microbeams embedded in an elastic medium', 1st International Conference on Mechanics of Composites (MECHCOMP2014), 8-12 June 2014, Stony Brook, USA. 'Static analysis of linearly tapered micro-beams via modified couple stress theory', International Symposium on Advances in Applied Mechanics and Modern Information Technology, 22-23 September 2011, Baku, Azerbaijan. 'Stability analysis of carbon nanotubes (CNTs) based on modified couple stress theory', 6th International Advanced Technologies Symposium (IATS’11), 16-18 May 2011, Elazığ, Turkey. 'Free vibration analysis of carbon nanotubes based on nonlocal continuum and gradient elasticity theories', 6th Nanoscience and Nanotechnology Conference, 15-18 June, 2010, Izmir, Turkey. 'Mechanical modeling of microtubules based on nonlocal continuum theory', 15th National Biomedical Engineering Meeting, BIYOMUT, 21-24 April 2010, Antalya, Turkey. 'Free Vibration And Bending Analysis Of Carbon Nanotubes Using Nonlocal Euler Beam Theory', International Symposium on Engineering and Architectural Sciences of Balkan, Caucasus And Turkic Republics, 2009, Isparta, Turkey. 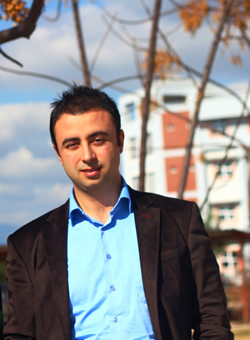 1st Rank in Undergraduate Program, Akdeniz University, 2009.